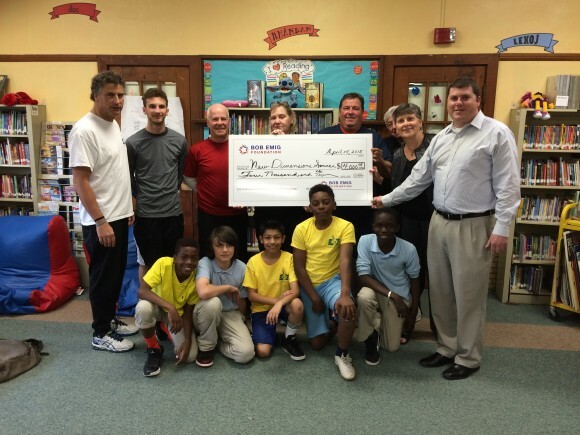 The Bob Emig Foundation presented a check for $4,000 to New Dimensions Soccer in support of its after-school program at Mason Elementary School in St. Louis City. The school serves more than 400 students from Pre-K to 6th Grade; over 40% are immigrants or refugees. The Monday/Wednesday after-school program engages the student in grades 3-6 in activities that include soccer skills, playing the game, life skills development and other enrichment activities. New Dimensions Soccer co-founder Tom Michler says the keys to the success of the program are mentoring and keeping it fun. In addition to soccer skills, the youth learn what it means to be a good teammate and other values, and life skills. The Foundation raised funds for the program at its Celebrating Leaders in Youth Sports event held in October. The event honor leaders in youth sports who demonstrate the principles that the Bob Emig Foundation encourages, especially “going beyond the game” to be a role model for youth on and off the field.